After leaving Washington, D.C. and the intense five days we had spent there, we took a week to leisurely drive home taking a scenic route. The weather didn't cooperate like it had the previous week. Lots of fog and rain. However, the days we had sunshine however were spectacular. Sherri and Chip met us for two days in Lynchburg, VA. and got to have family bonding time together! These are the best scenic shots. 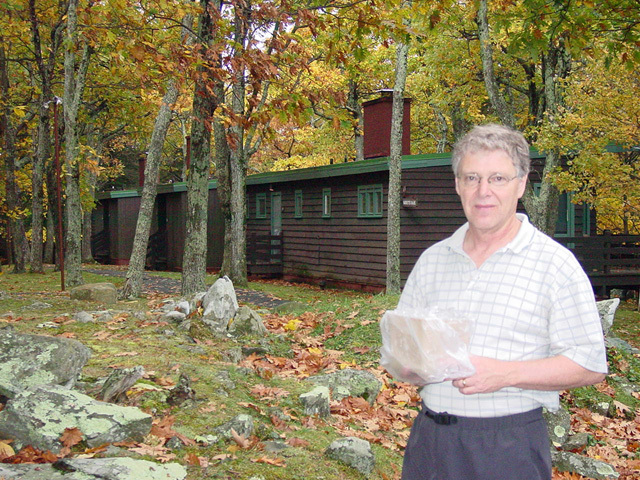 Mike at our cabin at the Skyland Resort on the Skyline Drive in Virginia. 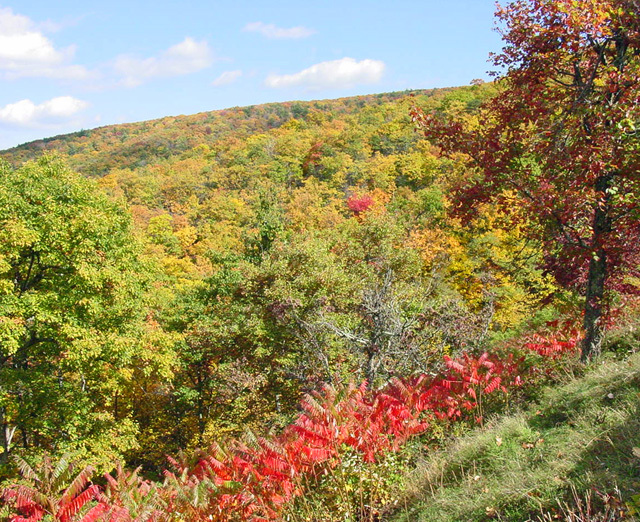 The Skyline Drive runs 105 miles north and south along the crest of the Blue Ridge Mountains in Shenandoah National Park and is the only public road through the park. 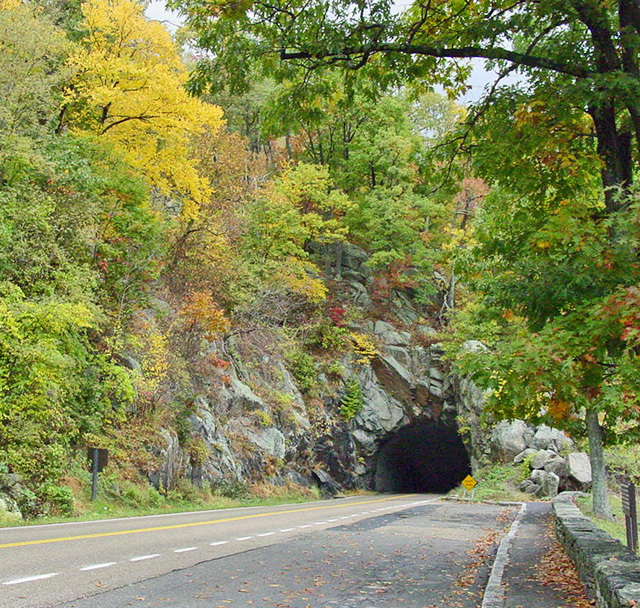 The only tunnel on the Skyline Drive passes for 700 feet through Mary's Rock Mountain. It was blasted out of granite- like rock. It takes about three hours to travel the entire length of the park on a clear day. We took the whole day it was so beautiful! Mike films the clouds rolling in over the mountains. A little bit of sun shining on the Shenandoah Valley. 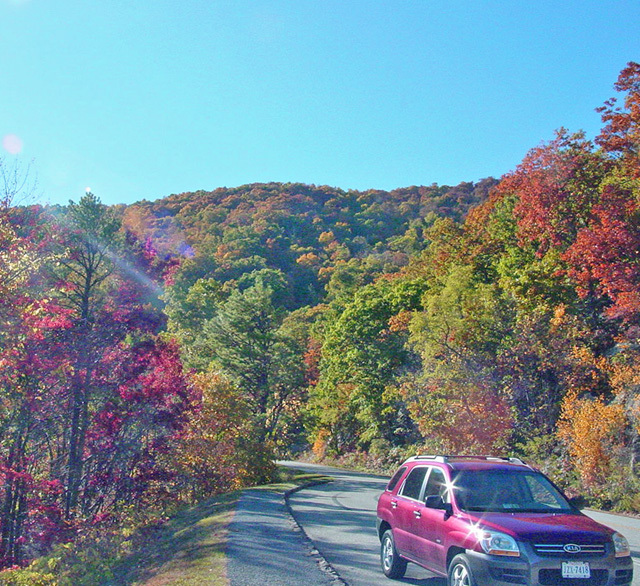 The sun highlights the colorful leaves on the trees along the Blue Ridge Parkway. 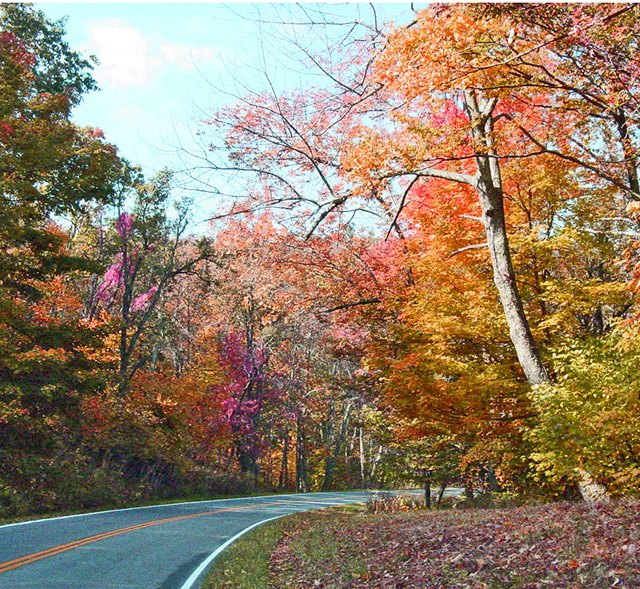 A drive down the Blue Ridge Parkway is meant to be slow paced and relaxing. 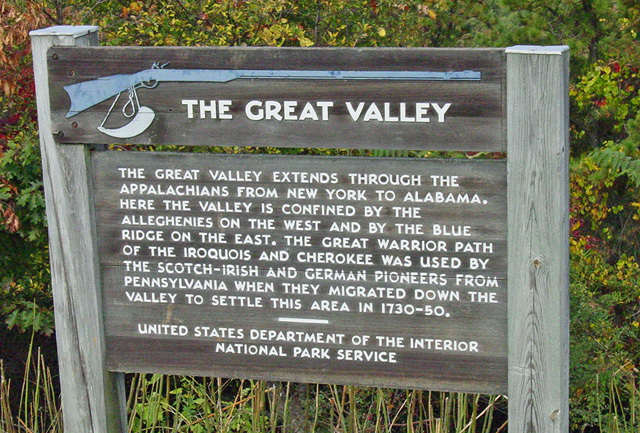 A stop at almost any overlook or trail will reveal much of the natural and cultural history here. 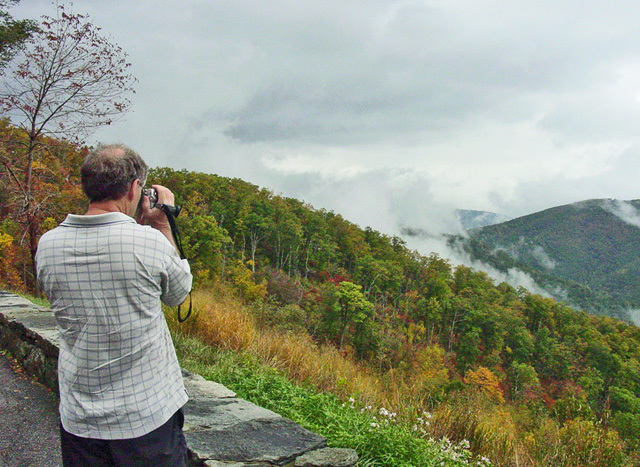 The Parkway meanders 469 miles between Shenandoah and Great Smoky Mountains National Parks, so lots to explore. 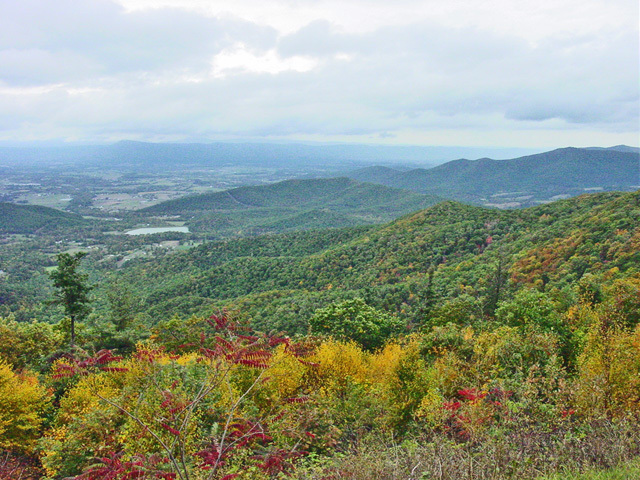 By the 20th century, the Blue Ridge was viewed as a desirable location for men of wealth to build retreats. 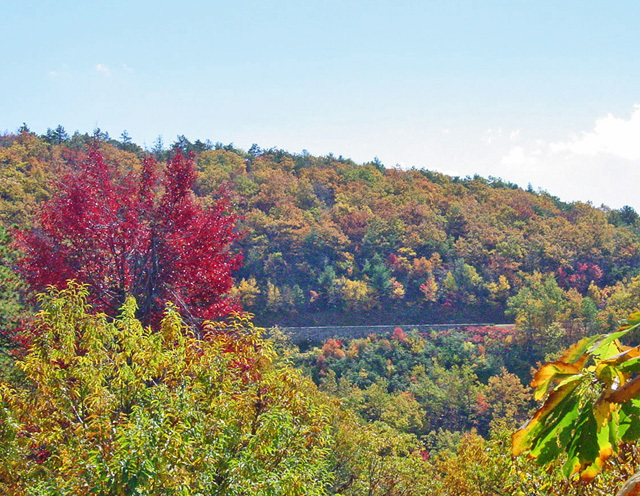 The most obvious modern contributor to the landscape is of course the Parkway itself, conceived and designed 60 years ago as a scenic motor road and conservator of the natural and historical treasures of the Blue Ridge. 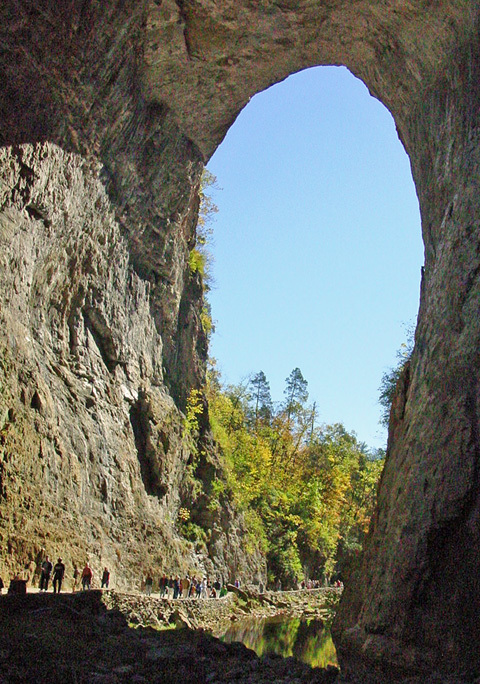 Today, it is the most visited site in the National Park system. 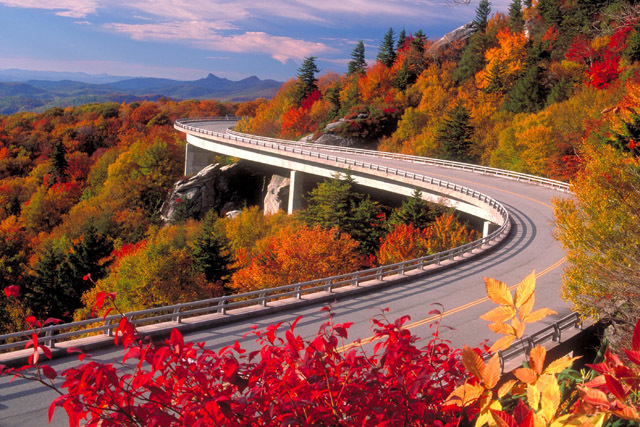 Begun during the administration of U.S. president FDR, the project was originally called the "Appalachian Scenic Highway." 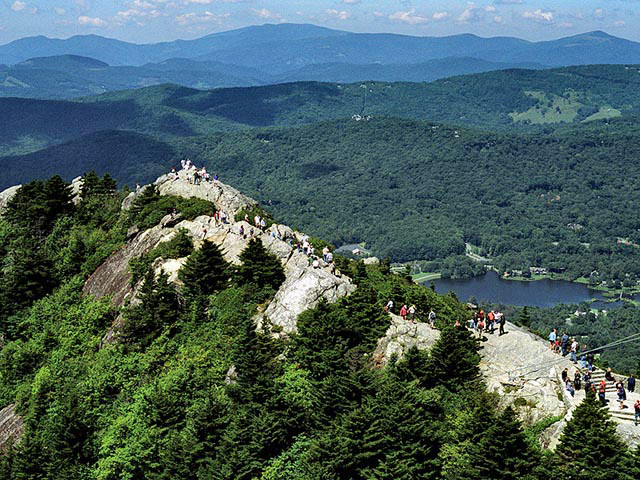 Construction of the parkway took over fifty-two years to complete, the last stretch (near the Linn Cove Viaduct) being laid around Grandfather Mountain in 1987. 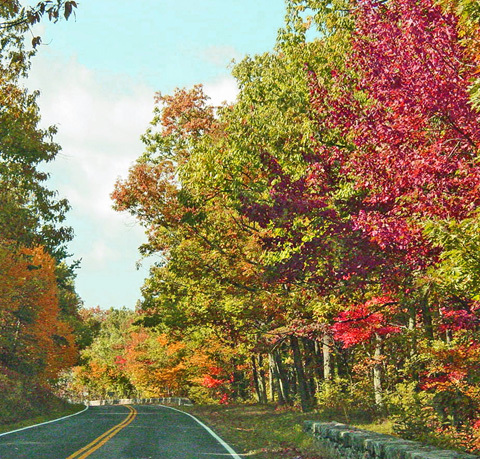 The parkway uses short side roads to connect to other highways, and there are no direct interchanges with interstate highways, making it possible to enjoy wildlife and other scenery without stopping for cross-traffic. Mileposts along the parkway start at zero at the northeast end in Virginia and count to 469 at the southern end in North Carolina. We purchased the mile-post book to use as our "tour guide". 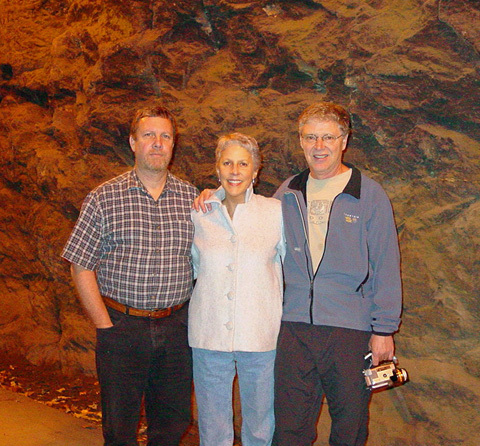 Chip, Sherri, and Mike in a tunnel on the Riverwalk in Lynchburg, VA.
We spent two days with them and stayed at the Super 8 motel off the parkway in downtown Lynchburg. 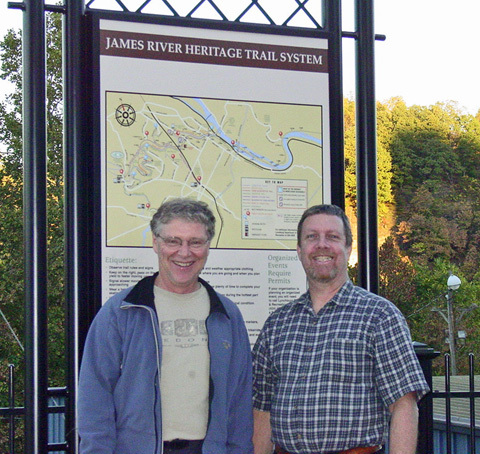 Located in the foothills of the Blue Ridge Mountains along the banks of the James River, Lynchburg is known as the "City of Seven Hills"
Old, but still as cute and crazy as ever, just like Sherri and me! The four of us take a drive in the mountains nearby. The weather was excellent and we got took lots of colorful photos. Taken on our afternoon mountain drive with Sherri and Chip. 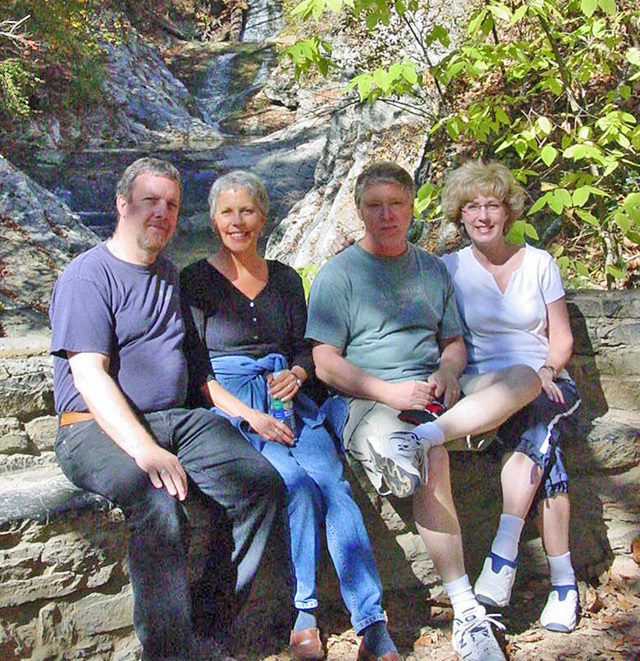 We take a break from our walk along the trail at the Natural Bridge. A shot from under the Natural Bridge. 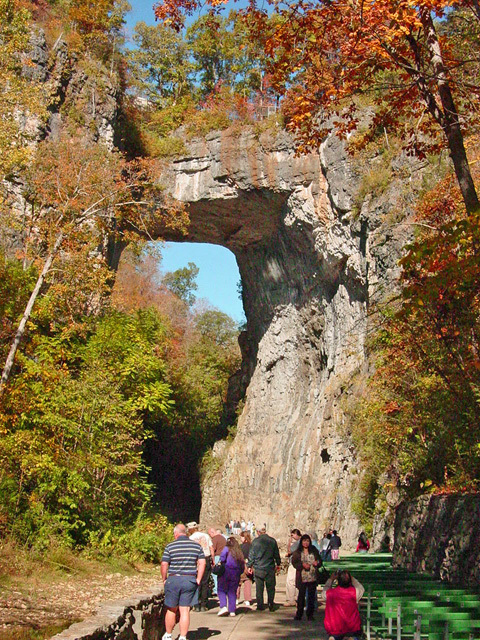 It is a geological formation in which Cedar Creek (a small tributary of the James River) has carved out a gorge in the mountainous limestone terrain, forming an arch 215 ft (66 m) high with a span of 90 ft (27 m). It consists of horizontal limestone strata, and is the remains of the roof of a cave or tunnel through which the creek once flowed. 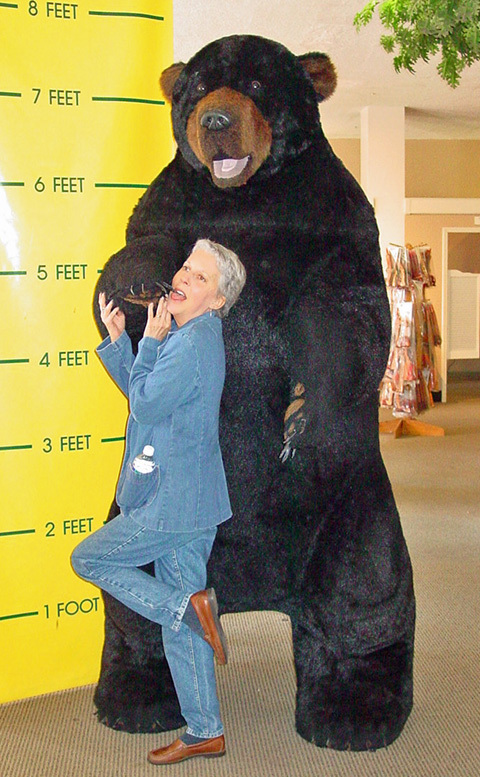 Sher-Bear has a Bear encounter back at the visitor center. We just can't take her anywhere without her "embearrassing" us! 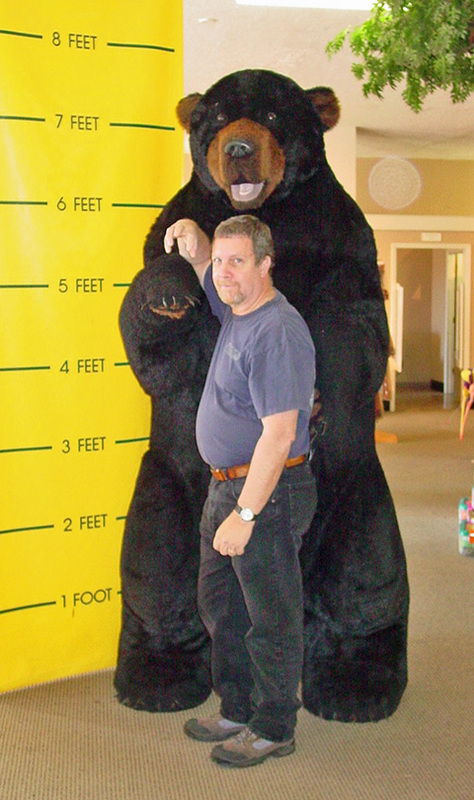 Chip had to spend time with the bear too. Mike and Kathie decided not to act so "childish" and just take pictures. 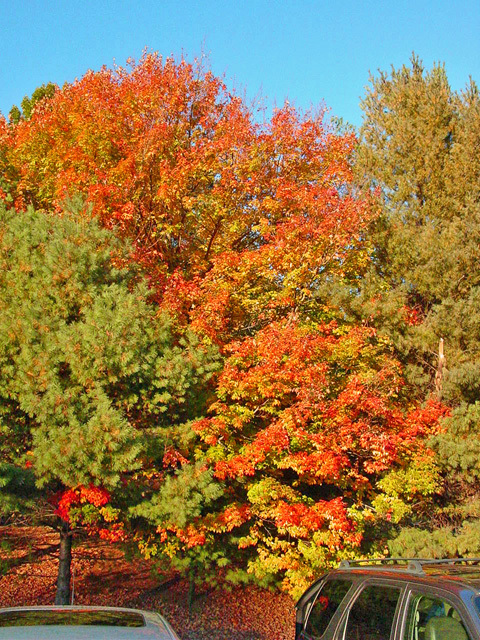 Some more colorful trees shining in the sun as we head back to the car and our drive back to Lynchburg. 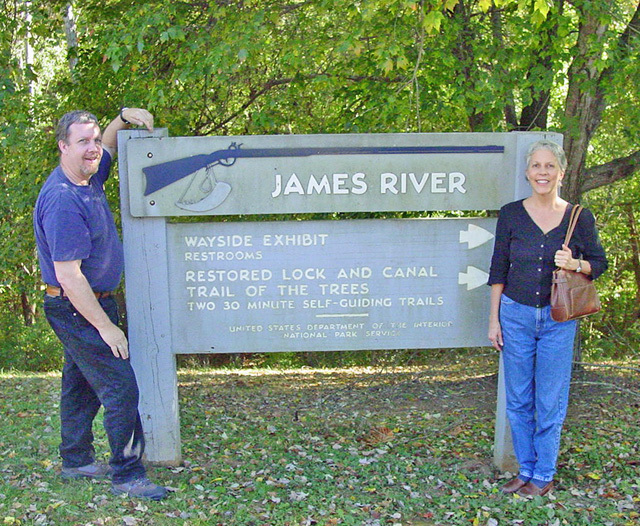 We stop at the James River exhibit to check it out and to use the much needed restrooms. 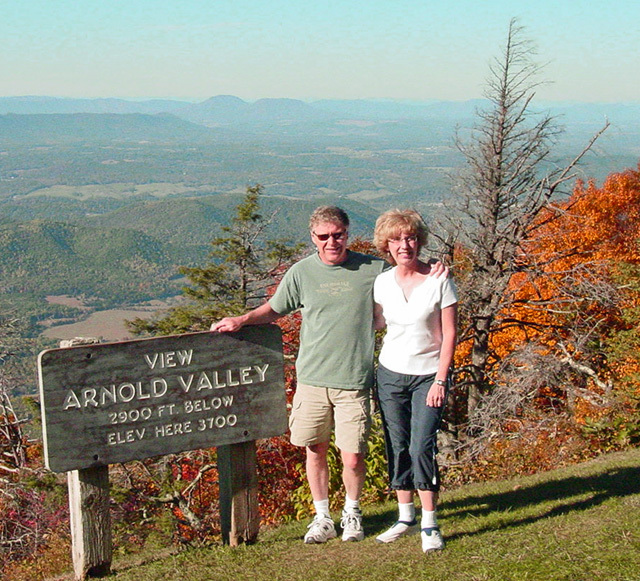 The following day we say good-bye to Chip and Sherri and start our day long scenic drive for Banner Elk, NC. We have reservations at the Best Western Mountain Lodge there. This is a informative sign at one of the overlooks along the way. 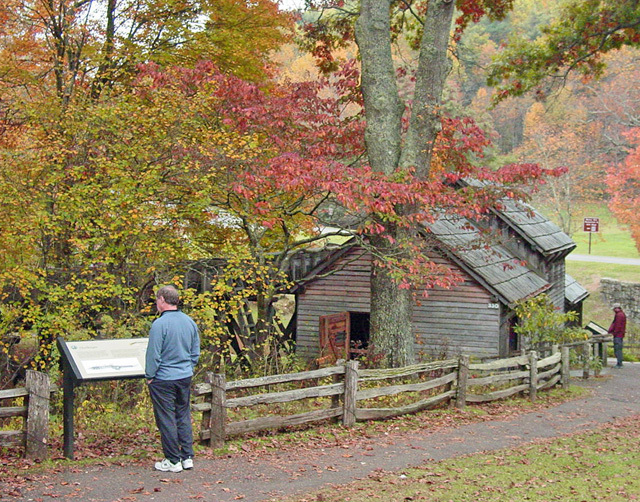 We stop at Mabry Mill at Milepost 176. 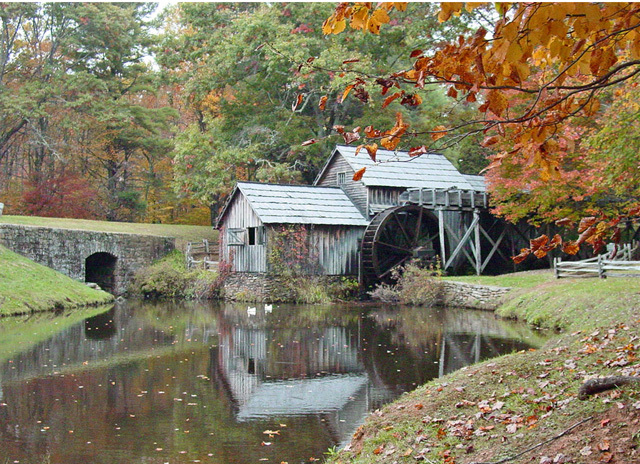 This scenic place was originally built in 1910, and the historic water-powered grist mill, sawmill and nearby blacksmith shop provide you with a view of pioneer life along the Parkway. We get a cup of coffee after I take numerous pictures and head on down the road. Mike reading an information board at the Mill. The Mill was the last place we got to take photos that day. The fog started rolling in and got so bad that we drove at a snail pace. What should have been a 3-4 hour scenic drive became a 9 hour nightmare. We finally made it to Banner Elk about 10 p.m. white-knuckled, stressed out, and exhausted. The next day we woke up to more fog. Trying to be optimistic we checked out the town of Banner Elk and local area. We drove to Grandfather's Mountain. 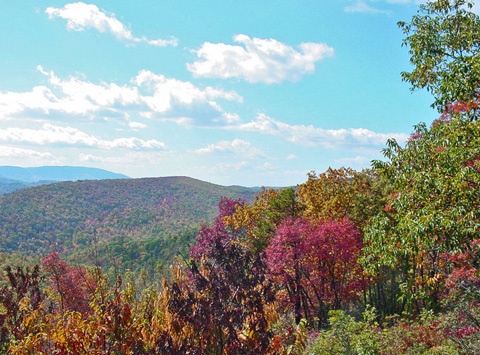 At 5,964 feet above sea level, it is the highest peak in the Blue Ridge Mountain Range. I wanted to walk on the mile high swinging bridge and do some hiking, BUT the weather did not cooperate. This is another person's photo of the Mountain and what we missed. Pretty spectacular. Oh well...just another reason to go back and visit. We drove to Linn Cove Viaduct (milepost 304) another point of interest nearby. 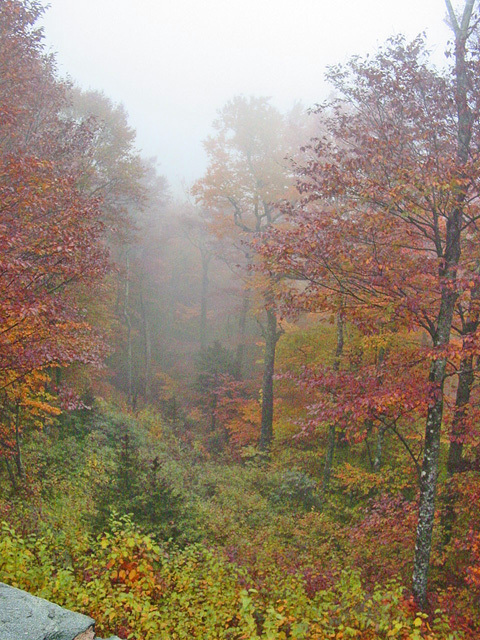 The visibility was still poor, although the fog did make the landscape beautiful in a different "quiet" way. We spent time in the visitor center and learned about the building of this amazing section of highway. A view of what we would have seen if the weather had cleared up. 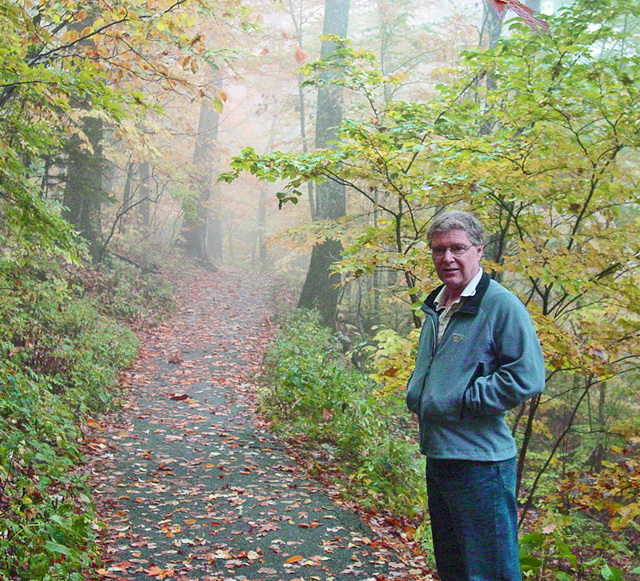 This was the last section of the 469 mile Blue Ridge Parkway to be constructed. It was completed in September of 1987. It took 20 years to solve the engineering obstacles that building the highway around this rugged and rocky section of terrain presented. The following day we drove to Asheville, NC. and spent the evening exploring the historic area that is filled with shops and restaurants. 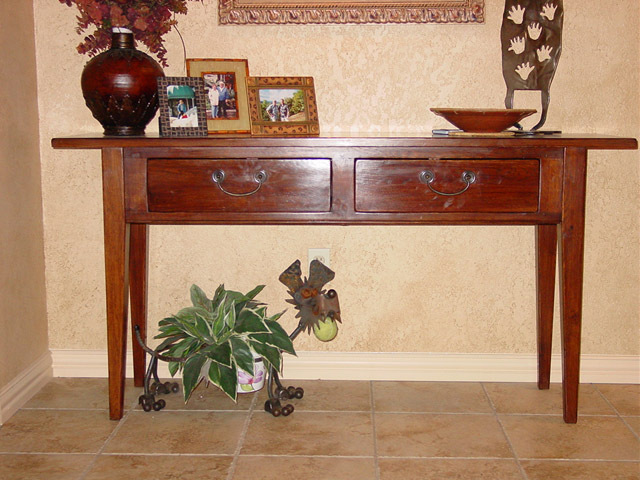 We found this table for our kitchen area. A nice souvenir. 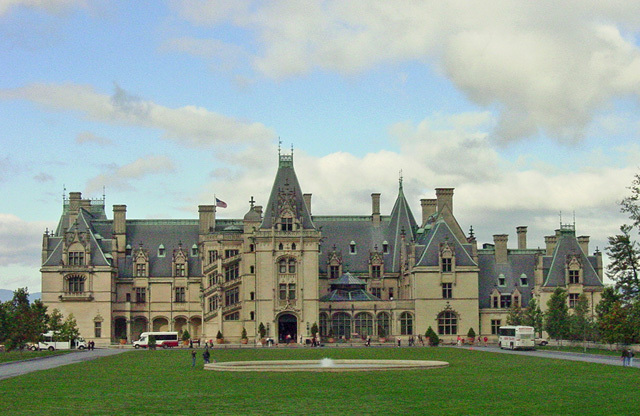 We spent the next day visiting the famous Biltmore Estate. It is the largest private residence in the America. George Washington Vanderbilt completed its construction in 1895. Built of massive limestone blocks and incorporating numerous architectural details, the home represented the wealth of the Vanderbilt family and the opulence of the period. 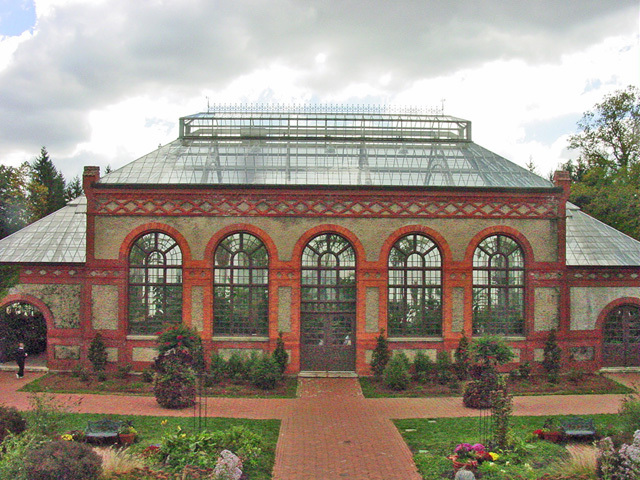 The conservatory sets near the mansion and is surrounded by beautiful gardens. This glass-roofed building nurtures exotic species and provides flowers and plants for the house. A partial view of the Walled Garden near the conservatory. 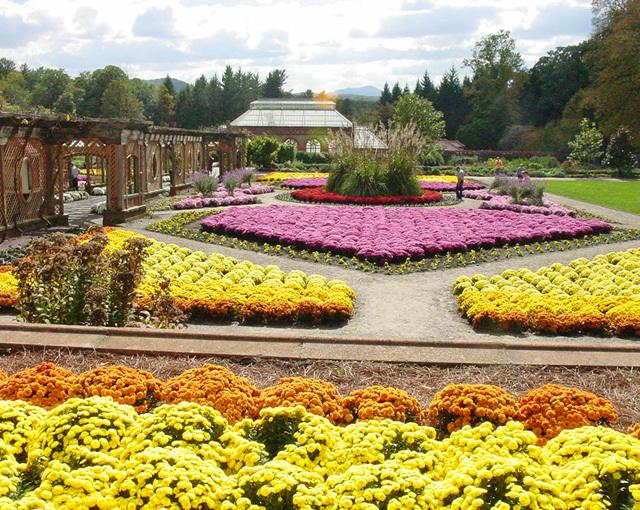 This is a four-acre formal garden filled with a variety of textures and colors. Walking paths connect the gardens and other areas around the estate. George Vanderbilt commissioned Frederick Olmsted, whose designs included New York's Central Park, to create the gardens and grounds for his estate. 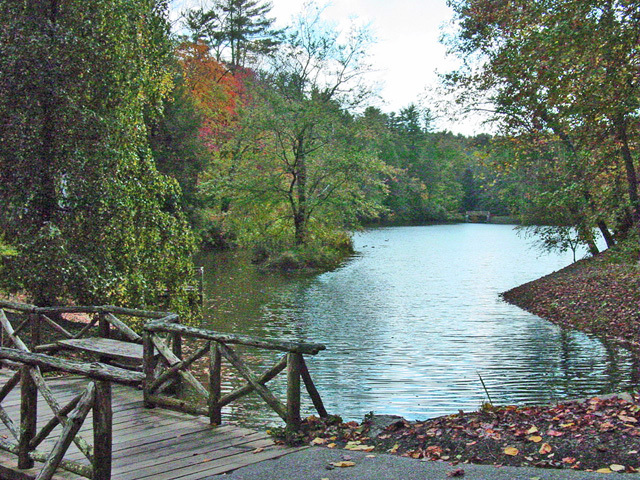 The Bass Pond is in a serene area below the Azalea Garden about 1/4 mile from the Biltmore House. 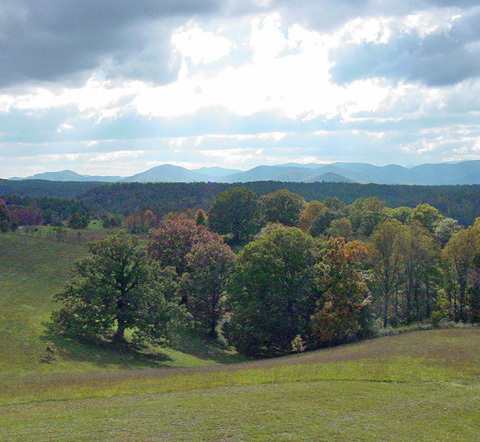 A view of the mountains and rolling countryside taken from a deck on the west side of the mansion. I became ill our last day in Asheville causing us to speed up our journey home. We didn't get to stop and check out many sites. 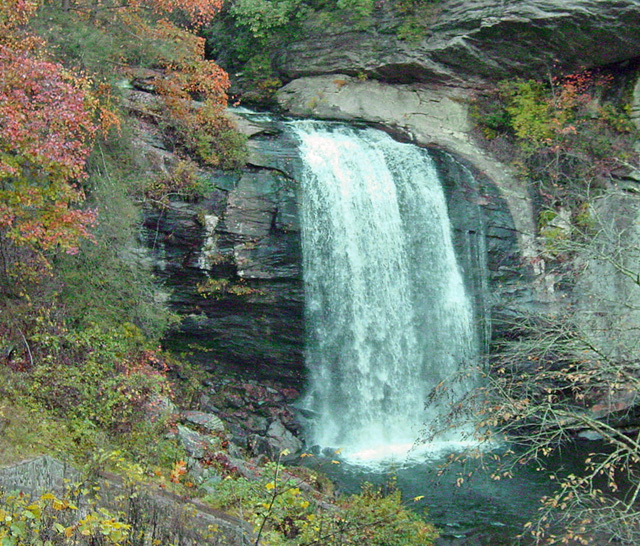 Here is a photo of a beautiful waterfall that we passed in TN. 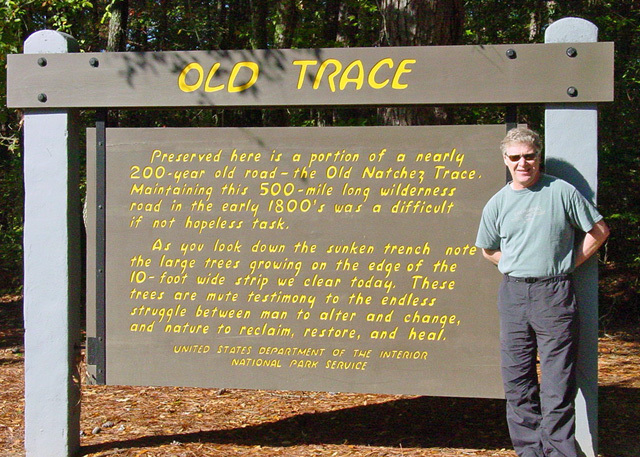 When we got to Mississippi we took the Natchez Trace scenic highway south for couple hundred miles. 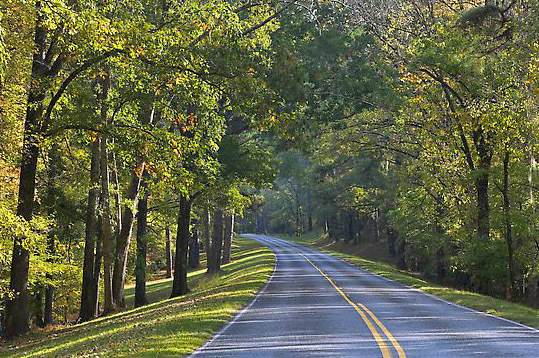 This 444-mile Parkway commemorates an ancient trail that connected southern portions of the Mississippi River, through Alabama, to salt licks in today's central Tennessee. A section of the scenic highway. 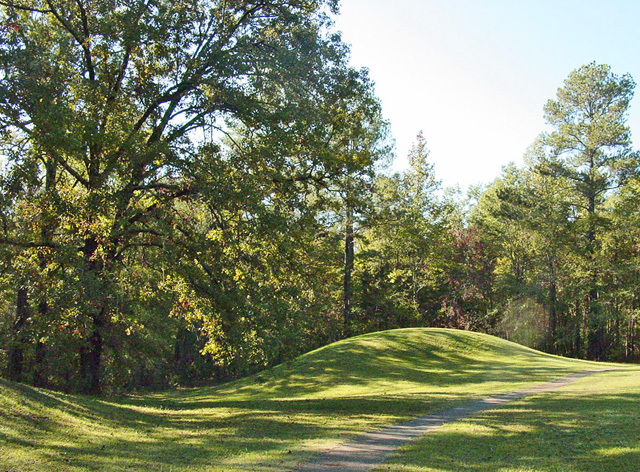 The six burial mounds and associated habitation area at the Bynum site were built during the Middle Woodland period, between 100 B.C. and 100 A.D. The mounds range in height from five to 14 feet. Five of them were excavated by the National Park Service in the late 1940s.